Hit the streets today with the new café racer inspired Pegassi Vortex motorcycle and starting this Friday, it’s time to enjoy the dark revelries of Halloween weekend in GTA Online with the release of the frightful new LCC Sanctus motorcycle, a bloodthirsty new Adversary Mode and more. And starting now through November 7, celebrate this month’s anniversary of GTA Online with a massive assortment of discounts spanning three years' worth of content updates, as well as a chance to score some serious bonus cash. 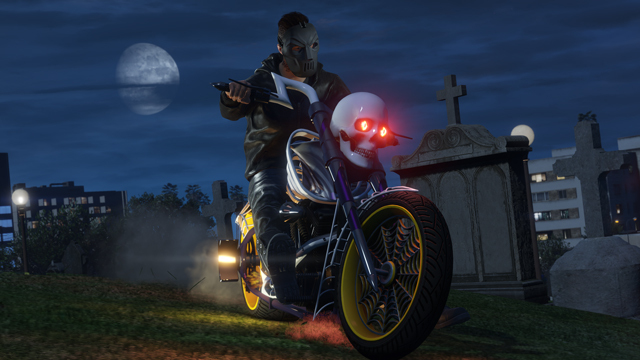 Coming this Friday, just in time for Halloween: Terrorize the streets of Los Santos with the menacing Sanctus. With its eerie skull-studded design, the Sanctus is a dread-inducing piece of machinery, guaranteed to strike fear into passersby on your next midnight ride. The new Lost vs Damned mode is a classic battle between the forces of good and evil, as hordes of Devils and hosts of Angels battle it out for the right to rule. Complicating the conflict will be a day/night cycle that switches every 60 seconds, with night time benefiting the Devils and day time rewarding the Angels – with increased Armor, Health and superior Weapon loadouts during each team's prime time. Classic GTA Online Halloween vehicles and items will also be returning along with some special Event Week bonuses that Rockstar will have more info on this coming Friday. 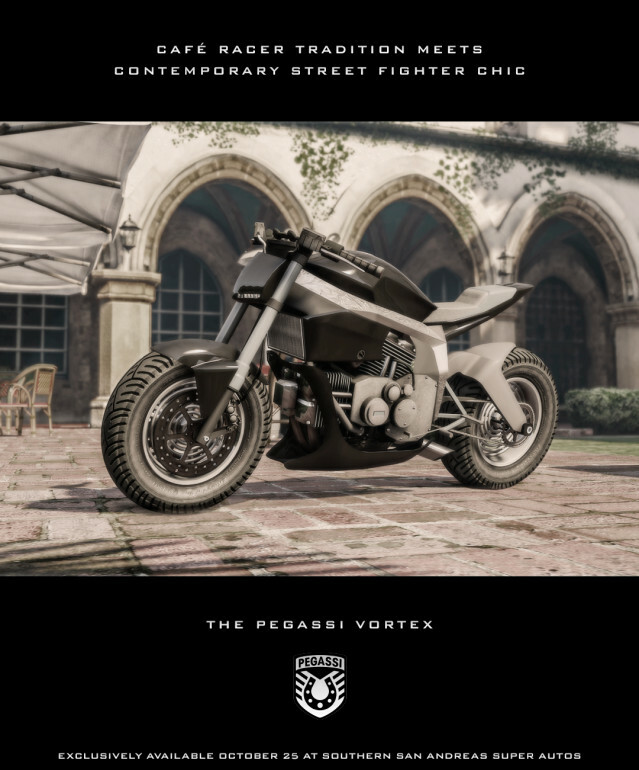 The latest addition to the collection of motorcycles from GTA Online: Bikers - Ride the highway to hell on the Pegassi Vortex, a sophisticated two-wheeled monster available for purchase as of today from Southern San Andreas Super Autos. Lean and lightweight, the Vortex is a versatile beast designed to suit every occasion. To commemorate three years of GTA Online, we're awarding anyone that logs in on PlayStation 4, Xbox One or PC from today through end of day Monday October 31st with a special GTA$250,000 gift, which will be deposited into your Maze Bank account by November 4th. 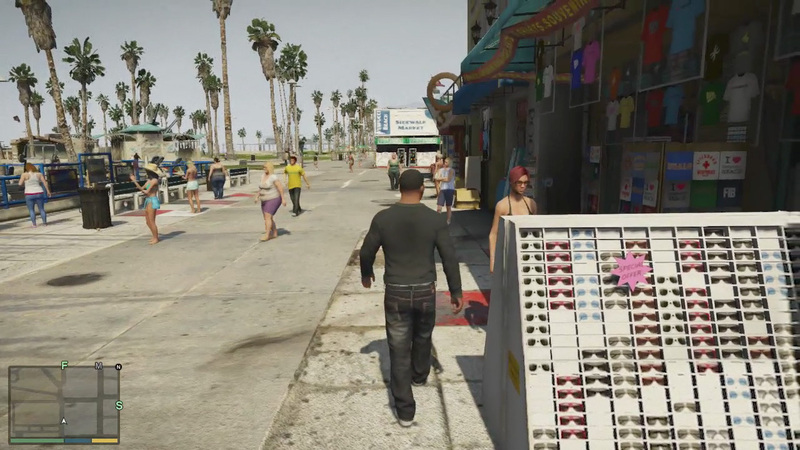 There's also 30% off a wide variety of vehicles, weapons and more – with fan-favorite items representing GTA Online content updates since November 2013's Beach Bum update - from the star-spangled Liberator to the devastatingly powerful Heavy Shotgun to the Zentorno, T20 and more. Rockstar has temporarily rescinded all rank and completion requirements, so you can take full, unadulterated advantage of these limited time discounts now through Monday, November 7th. And now through Monday October 31st, take the high road over Downtown Los Santos for a chance to win big in the Non-contact Premium Race "Nightlife" on Motorcycles. As always, Triple RP is awarded to all participants and a lucrative payout awaits those who finish in the top 3. Enjoy and join the chat in the forums! GTAO Halloween, Anniversary Specials - Bonuses, discounts, and new vehicles for new-gen GTA Online this weekend.